Grenada is another British West Indies country. 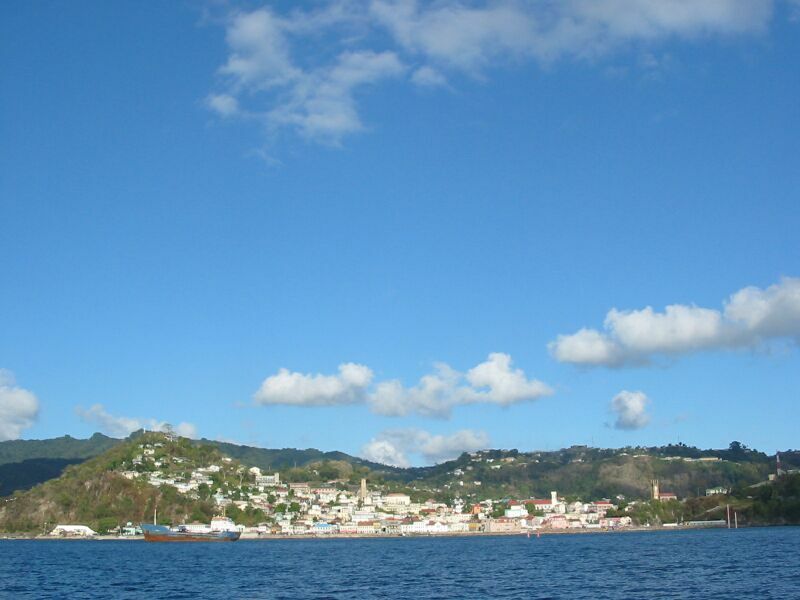 Grenada has one large island - Grenada itself, a second medium sized island called Carriacou, another smaller island called Petite Martinique, and the usual collection of even smaller uninhabited islands. Grenada is familiar to Americans because of the fighting force the US sent to Grenada to stop an attempt in the early 80s when Cuba and Russia tried to introduce communism there. There is a large medical school in Grenada attended by many Americans. The country's economy appears to be doing better than most of the other British West Indies islands today, and is decidedly democratic. Not far from Union Island, in the Grenadines, is the first northern island of Grenada - Carriacou (pronounced "Carry-coo"). We chose to sail there first and enter custom in Hillsborough, the primary port. Since we arrived late in the afternoon, we didn't enter customs until the next morning. We should note, we heard on the radio this morning - as expected - that the war with Iraq officially started on this day March 20th, 2003. There were more customs paperwork than usual for Grenada, and the entrance fees were nearly as high as in the Grenadines. After clearing customs, we moved to the next bay - Tyrell Bay, Carriacou as this was reported to be a more popular site with cruisers. Tyrell Bay is a well protected bay with a marina, good anchorage and a boat yard. There even appeared to be a hurricane hole on the north side with a river through some mangroves. We got our laundry together and took it ashore to the marina. They told us we could pick up what was done later in the day, and the rest in the morning - since we had a lot of laundry. We were low on dinghy fuel, and Frank found out the only gas station was back in Hillsborough. No problem, Frank decided he would take a bus over later. We went into the village at Tyrell Bay to find a cruiser-friendly Internet cafe and book swap we had read about. Only, we found it had moved over to Hillsborough. It appears that Hillsborough may be getting to be more popular as a stop for cruisers. Anyway, we found a little grocery store and got a few items. Frank dropped the girls and Karen at the boat, and then made the bus trip to Hillsborough. One interesting thing was that the busses take shortcuts on really bumpy roads (where a 4x4 would be better) to get to Hillsborough. He got the fuel, and eventually found a bus back - kids were getting out of school, so the buses were filling up. Fortunately Frank had taken a little cart to carry the fuel tank - a 5 gallon tank weighs a good deal. We went to dinner at the restaurant at the marina. They had about half the laundry done and folded. After a nice dinner, we picked up what was done and took it back to the boat. Karen and Frank started discussing possible alternate plans to going to the Mediterranean as anti-Americanism/anti-war incidents were being reported on the radio. On Friday, March 21, we did some cleaning and then Karen gave Frank a haircut. 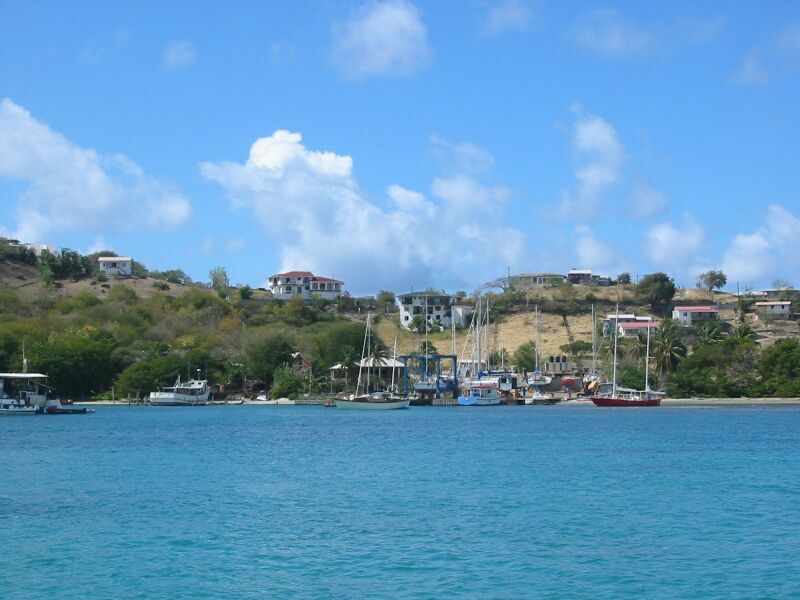 Frank went ashore and picked up the laundry and we prepared to leave Carriacou for the main island of Grenada. One thing we can say about Carriacou is that it was more relaxed and quieter than a lot of islands. Karen in particular really liked it. It was about 30 miles from Carriacou to St. George, Grenada. 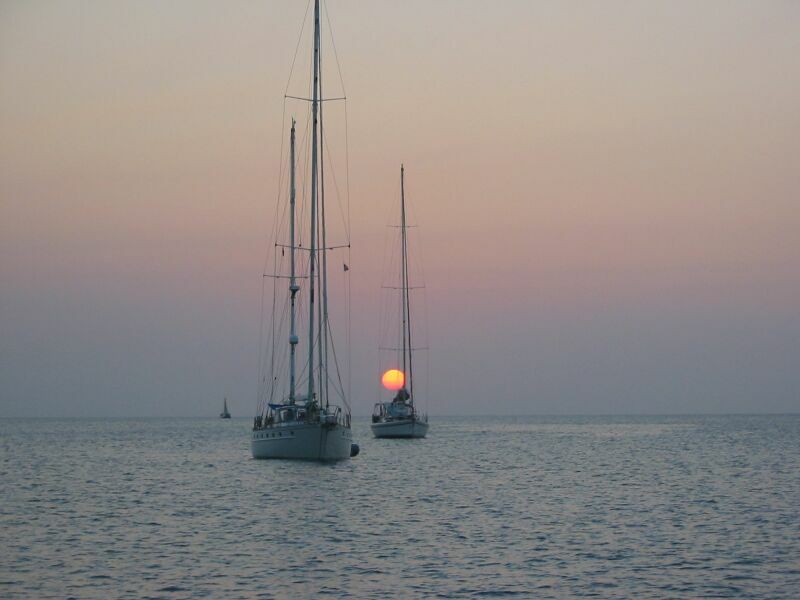 St. George is the main port and located on the southwestern end of the big island. 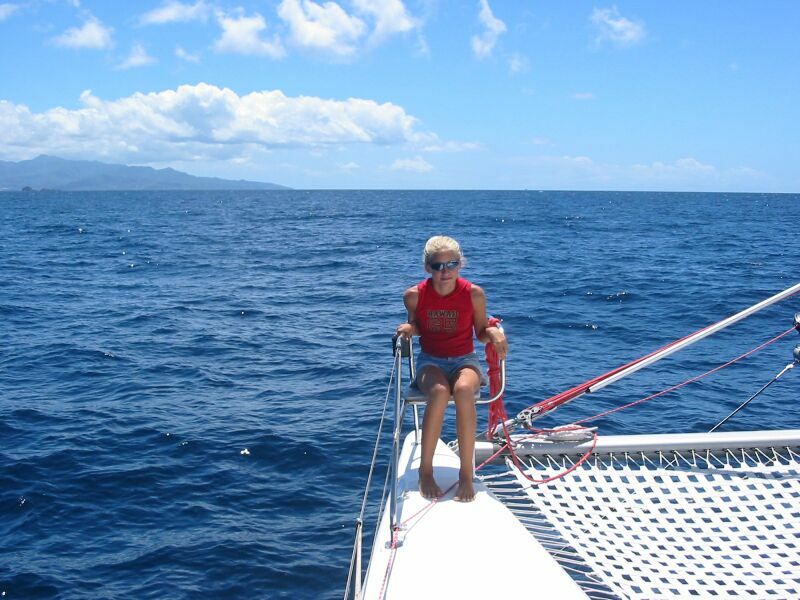 Before we got to the big island, we had to sail past a range of islands halfway between Carriacou and Grenada. 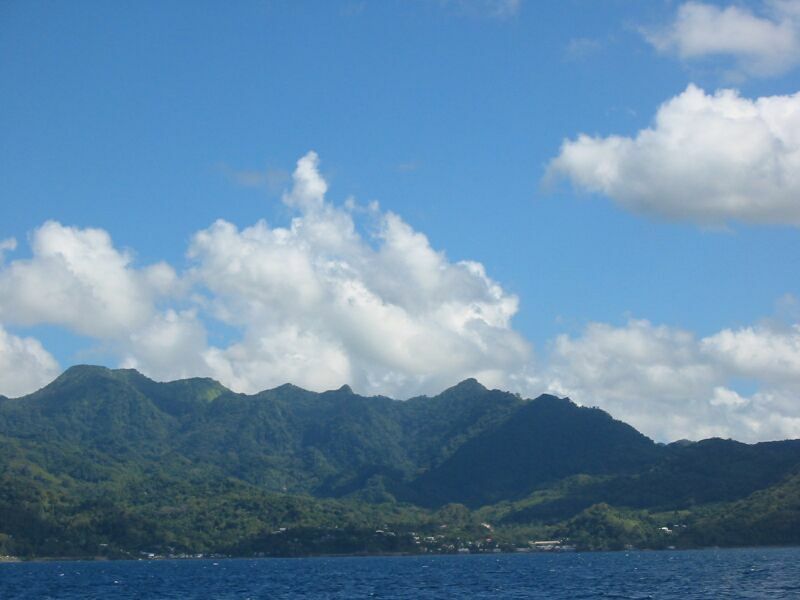 The biggest is called Isle de Ronde, and there is an underwater volcano (active as recently as 1989) near there which may someday be a new island here. The little islands near Isle de Ronde are home to some bird colonies. We saw lots of Frigate birds fishing as we passed, and Frank got excited as he saw tuna jumping out of the water as the birds circled just a few dozen yards away, he had a line out and was hoping he'd catch something - but, no luck. 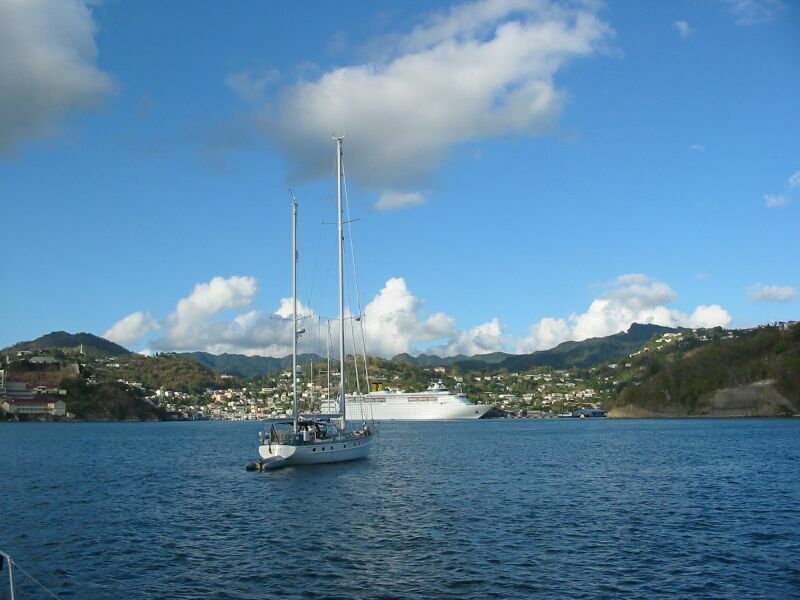 The big island of Grenada looks a lot like St. Lucia as you sail along the west coast. 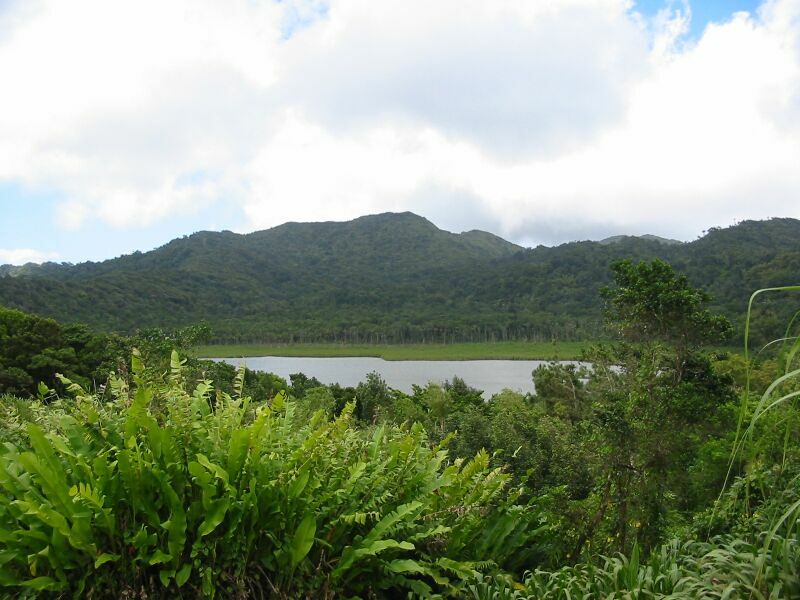 Signs of lucious vegetation, rain forests, and volcanic mountains. As we got in the lee of the island, the winds were cut off, so we started motoring close to the island as the island is steep to, i.e. deep waters until you get close to it. This improved the odds of catching some fish - still no luck. St. George is an interesting port. 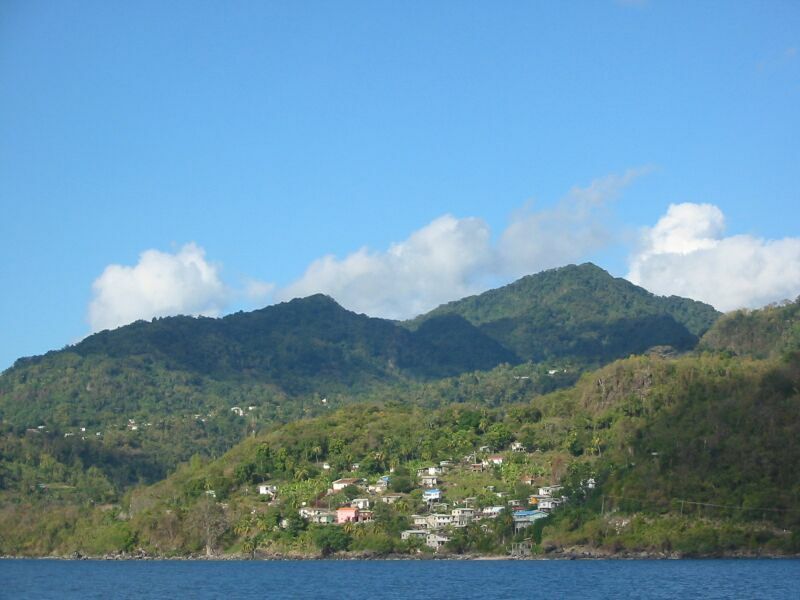 The city of St. George sits on the outside of a mountain on the western coast. On the other side of the mountain is a narrow passage into a harbour big enough for two medium sized cruise ships. There is also a large area where the ships turn around surrounded by shops and a street - this is called the Carenage (so called because in the days of wooden ships they would carene - i.e. pull the boats over onto their sides, the ships so they could clean and paint the bottoms). Off to the other side is a lagoon where yachts can anchor, and a couple of marinas. We anchored in the late afternoon just outside the harbour entrance. We didn't want to go into the lagoon where it would be crowded. We did some schoolwork and relaxed a while after the passage and planned to go into town the next day. We tuned the TV to the local stations and found they were broadcasting CNN, so Karen and Frank got to actually see some of the war news for the first time. The next day, we dinghied into the lagoon and found a marine chandlery, an auto parts place (a good place for some boat parts), and a nice supermarket with its own dinghy dock (which we only went in to check out as we didn't want to carry groceries around with us yet). We then parked our dinghy at one of the marinas and got a taxi into town. In town, we found an Internet Cafe and Frank downloaded E-mails and checked on the news, etc. The girls and Karen went to some bookstores. Later we went to lunch at a KFC where we met a couple of crew members from one of the cruise ships. We had pleasant chat with them about cruising on sailboats verses the cruiseships. We then went back to the dinghy and went over to the supermarket and did some shopping. We went back to the boat and after a rest, reset the anchor as we had somehow gotten closer to some other boats there. We also made some banana smoothies to cool off. The next day was Sunday so no schooling. Frank suggested we should move to one of the bays on the south side of the island and try parking in a marina for a couple of nights. This would give us a chance to wash down the boat, which seriously needs washing at this point since we hadn't had any rain in two weeks. We found out from the locals this is the dry season around here. We motored around to the south side, and the winds were such that we ended up just motoring all the way to Mt. Hartman Bay, where a marina run by the Moorings Charter Company is located - called Secret Harbor Marina. We pulled up and hailed the marina on the radio and were told to Med Moor on the docks on the eastern side next to another catamaran. Med mooring is where you drop your anchor and back up perpendicular to the dock with docklines holding you close to the dock. We've done this before, so didn't anticipate too much problem and the winds were right. We dropped the anchor and started backing into the dock. The only problem was that our anchor wouldn't seem to hold. So, we started to pull it back up - only it got fouled (caught) on something and we couldn't free it. Well, since it was holding we decided to go ahead and park. So, we did. A couple of boaters on the dock helped us with our lines. Once we got parked, Frank got the other anchor out (a lighter anchor) and took it out with the dinghy and set it. It set quite well (it is a Fortress anchor which holds well in silt). Frank then dove on the fouled anchor and found that it was caught in the chain of an old mooring left on the bottom near the docks. It was too deep and silty to try and fix by free diving, so he had to dive with our emergency air tank to free the anchor and then reset it at another point. Basically, Frank ended up spending a good couple of hours with this mess. In the meantime, we had lunch and Frank signed us in to the Marina and got a meter for the water. So, we spent a couple of hours washing down the boat. The girls were a big help for most of this time with the washing. Frank bought some ice and we made some smoothies to cool down. Then we all went ashore and took some showers with unlimited (verses our boat) water. Unfortunately, there was no hot water though. Frank agreed to have us go out for dinner, so we walked up the hill to the hotel restaurant and had a nice - if a bit pricey - dinner. The next day we wanted to do an island tour, so we got ready and walked up and made arrangements with one of the taxi drivers who waits in the area. His name was Rock, and we really liked him. He was a career tourist driver, and puts his education of the island's history to good use. He gave us a very good summary of the island's history, with special emphasis on the revolutionary period where the Americans came in to help. He was cognizant that we wanted the girls to get some educational value out of the day, and was quite good. Needless to say we tipped him well. Along the way, while Rock was talking, we saw the beautiful scenery along the western coast and stopped a couple of times for pictures. Our first stop was at a cocoa and spice factory/plantation. We got to see how they dry the cocoa beans on big rolling pads which can be pushed under the building if rain comes. Karen bought some spices before we left. We then took a beautiful road up into the mountains where we went right through east-Indian-descent-run farms of all kinds of fruits and vegetables - like bananas, nutmeg nuts, all kinds of spices, mangos, etc. It was beautiful all the way, and we wished we could have afforded to have the driver stop and let us take lots of pictures. But, we needed to push on to the lake where we expected to get lunch. 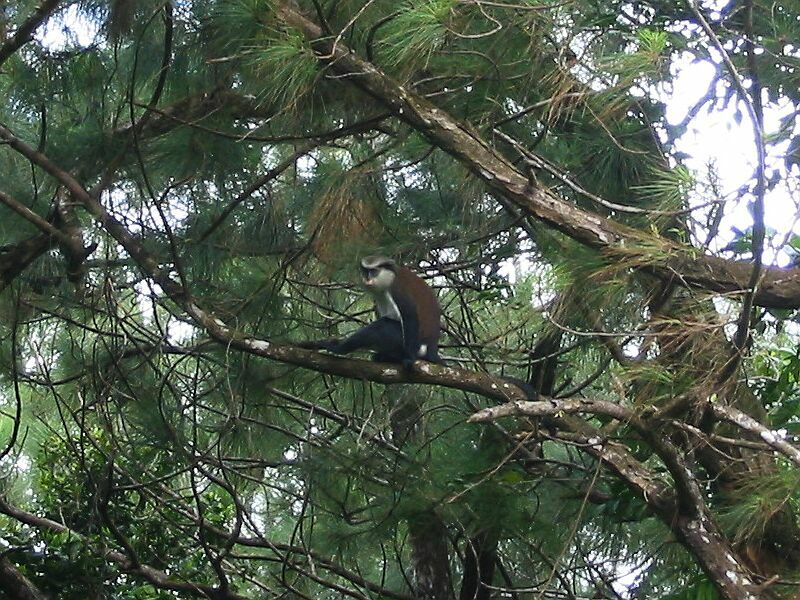 Along the way, Frank spotted a monkey in a tree near the road and we got some pictures. We finally got to the lake and went to get lunch. Unfortunately, the bar/restaurant wasn't serving lunch. So, we went to the Snackette which did serve lunch. We got some hamburgers and fish sandwhiches and sodas. We then went to the little museum, paid a few dollars and then went down to see the lake. Not much to look at except for beautiful scenery. Frank wished we had time to go on a hike as there were all sorts of nice looking trails going up to different mountains. We then rode back through the mountains the other way (the way normal tourist come up from St. George) and saw many other nice sights and watched kids getting out of school. We ended up at the sugar factory, only to find out after we paid the tour fee that it was only a rum factory now. Which was ironic because Karen specifically picked this place out because it claimed to be a sugar factory. Oh well, we did the tour and it was kind of interesting. 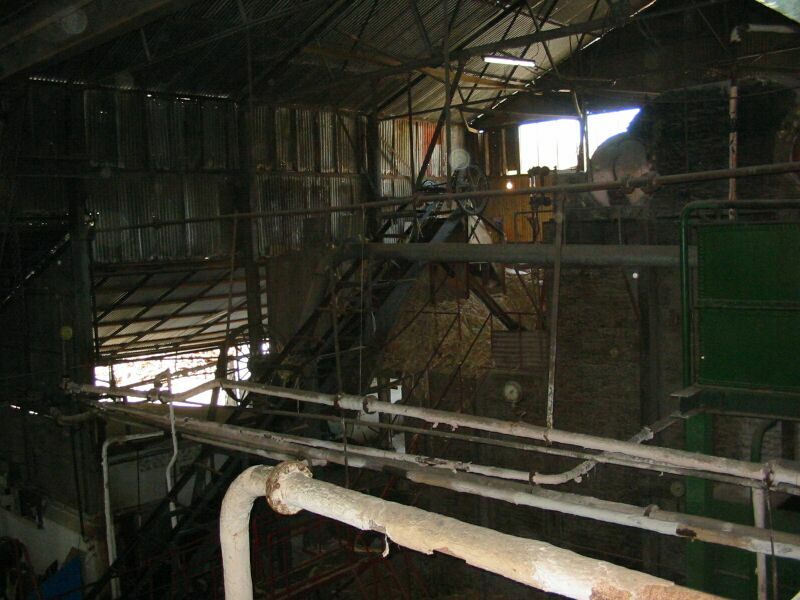 They used all very old equipment including a working steam sugar cane processing system. Interesting. We sampled some rum and ended up buying a bottle and some samples for gifts. We then went to go to an ATM, and got the cash to pay our driver. As we were driving back to the marina we bought some bananas from a lady on the side of the road. We gave our taxi driver our left over paints from when the girls painted their room as an additional tip on top of the cash we gave him. When we got back, the girls immediately wanted to go to the hotel pool (that they found out marina guests were allowed to use). So, Karen went with them while Frank did some more cleaning on the boat. The next day, we did some more schooling and cleaning up the boat. By mid-morning we were ready to leave the marina and we successfully got both anchors up without any mishaps. We sailed our way back around the point and into St. George Harbour again and dropped anchor. We planned to do a day of provisioning and leave the day after. 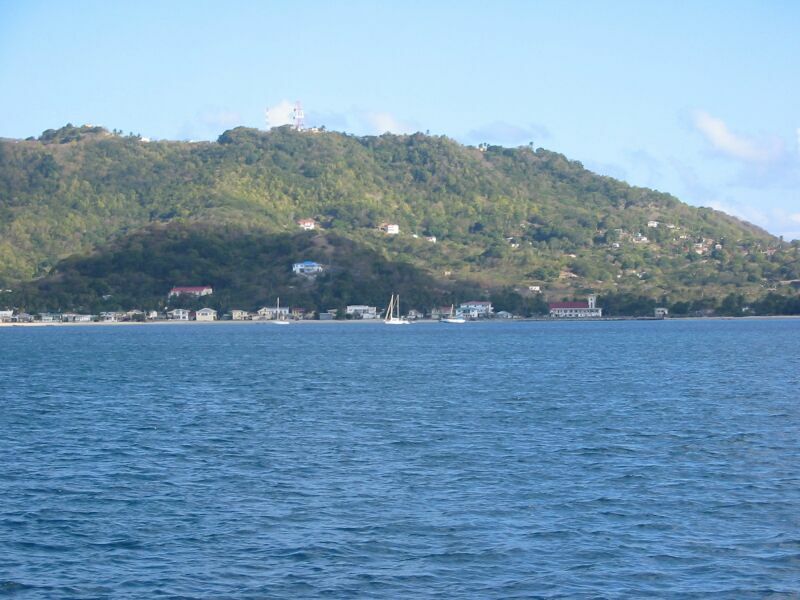 That evening we went ashore on the south side of St. George in the part of the bay called Grand Anse. There was a shopping center we saw when we drove through by taxi, so we checked it out and got some ice cream. The next day we went to the shopping center and did some provisioning. We also went to the cafe where the ice cream was located and got some pizza. We found out they had a very American selection of sodas: Mt. Dew, Dr. Pepper, etc. It turns out this place is frequented by students from the Medical School (many of which are Americans). The pizza was really good. Once we got all the groceries back to the boat, Frank went off to finish the preparations for departure. He went to the chandlery to buy some stuff for the boat, the auto parts place again, and then downtown to an Internet cafe to check the weather and E-mail. Then back at the marina he went to the customs office and cleared out. One last stop at the grocery store to get some items we didn't get earlier, and then he went back to the boat. 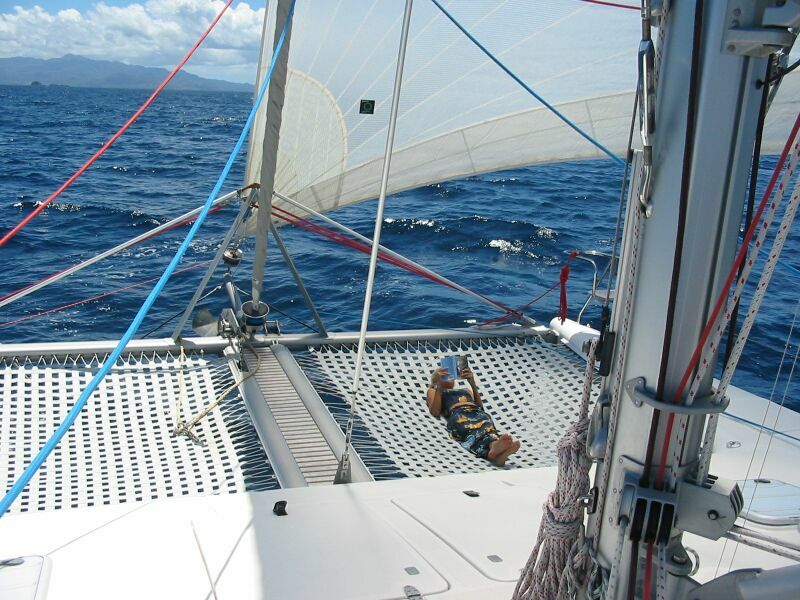 Our plan was to leave the next morning to sail all the way back up to Rodney Bay, St. Lucia. We prepped the boat for departure - including raising up the dinghy, and Frank worked on the engines to check the belts, oil and water levels. One of the bilge pumps isn't working right, so it will have to be replaced. The next morning, on March 27th, we got up and left at 7:00 AM for Rodney Bay, St. Lucia - about 140 miles away. We expected to get there early the next morning, but thanks to good winds, we managed to arrive just after midnight. 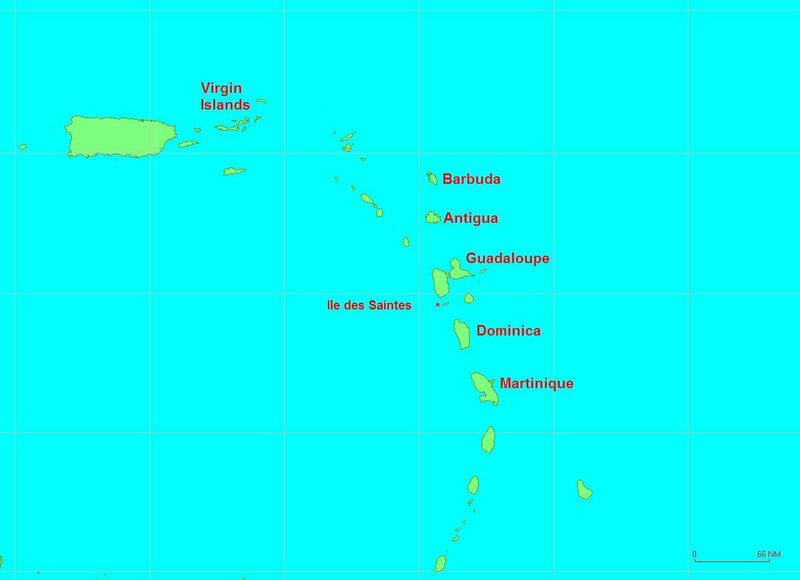 The plan is to stay a few days, and then continue on our way up to Antigua.